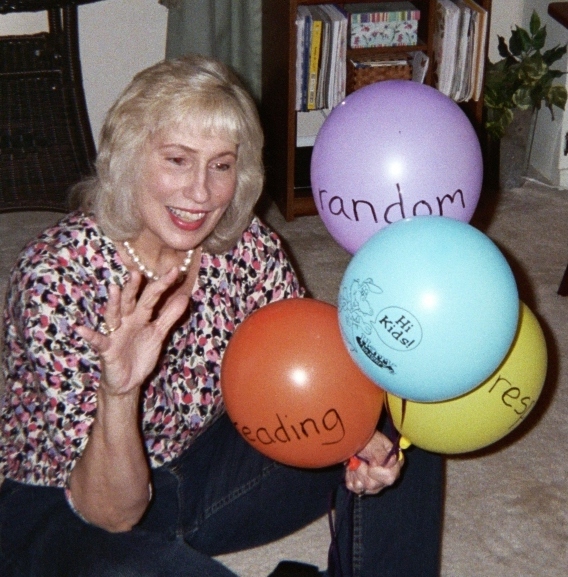 Home » Posts » Attentionology for K-5 Teachers » Help Readers by Popping Balloons! Help Readers by Popping Balloons! Hi and welcome back to Attention-ology for K – 5 Teachers! The “MomCentric” section of a recent issue of Redbook magazine caught my attention with a review of Ron Clark’s book, The End of Molasses Classes: Getting Our Kids Unstuck. Mostly geared for parents, one of his strategies for helping kids focus struck me as suitable for elementary classrooms, too. Play with words; pop balloons! and challenge children to define the words from memory. Each child that states a correct definition gets to pop that word balloon. Fun! 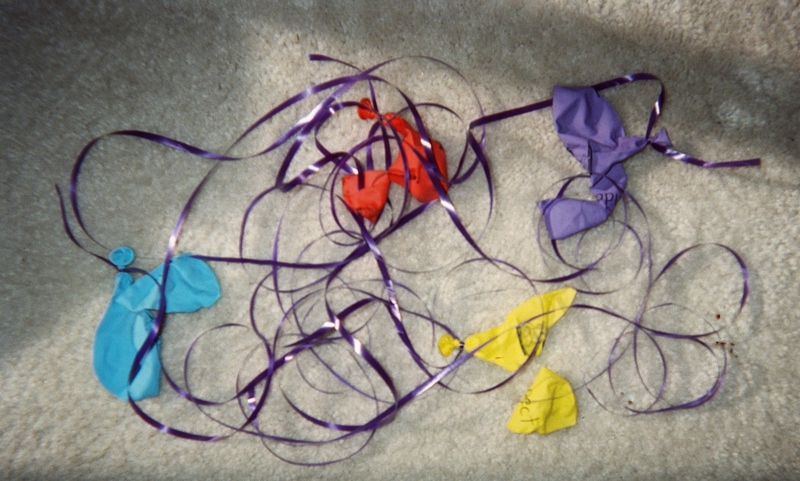 Who knew that remnants of popped balloons like you see in my next blog pic (scroll down) would represent such positive, not negative, outcomes. I got to thinking about other tricks that K – 5 teachers could “perform” with balloons. How about engaging your class in a game of Word-Flash – Spell-Pop. How to play? 1) Blow up a set of toy balloons. (I got mine free from a supermarket chain that gives balloons away to promote their stores and put smiles on children’s faces.) 2) Write vocabulary words on them. 3) Invite volunteer students to come to the front of your classroom. Give one balloon to each student, asking them to hold the balloon with the vocabulary word facing them, not their classmates. 4) One by one ask the balloon-holders to flash their word to the class, then back so that the word is hidden. 5) Call on a student who wants to spell the word out loud. If that student gets the spelling correct, he or she gets to pop that balloon. Popped balloons "spell" smart students! Optional: Color-code the balloons you use for the game, Word-Flash – Spell-Pop so that, for example, all of the yellow balloons are verbs, aka, “action words.” You get the idea; you can make up all kinds of variations to games with balloons to help kids develop reading and writing skills. Teachers are constantly challenged with addressing the unfortunate reading-related statistic noted in the same issue of Redbook…nearly 40 percent of fourth grade students in America read below grade level. (I’ve seen various statistics on reading test scores in different states and nationwide in the US, and you may site your own school’s results.) Certainly we all have students that need extra help learning how to read, and as importantly, to love to read! A nice tie-in to playing language arts balloon games with children in the early grades would be to introduce them to the classic children’s story, The Red Balloon, by the French author, Albert Lamorisse. As you may know, this enduring tale is one of a young boy and his best friend – a bright red balloon. The book was also made into a charming movie. You can access information about The Red Balloon online. Just Google the title. Popping balloons to catch and keep students’ attention isn’t an activity that needs to be limited to reading time in class. I can picture kids having a wonderful time popping balloons when they get answers correct to math problems printed on the round rubbery toys. Ask students to write the correct answers on the balloons with a dark marker before they pop them; this will help your class retain math facts. Inviting older elementary school students to check out the history of toy balloons can lead them on a scientific study into the world of hot air balloons. I’ve always wanted to lift off in one of them; have you? Ah, no pun intended, but I should put flying in a hot air balloon on my “bucket” list. Hope you laughed just now. I’ve recently discovered more scientific evidence that a part of our brains activated by laughter and lighthearted conduct and feelings is well suited to finding clever, effective solutions to problems. Teachers can use that science; it sounds magical to me! Remember, you don’t need to be a magician to work magic in instructional settings! This is the absolute worst idea I have ever seen in my entire life. To have young children violently popping balloons with small pieces all around. We teach our students to take care of their toys and not to destroy them. Maybe in Boy School or Girl School this would be a good idea, but not with innocent children. Shame on you squared! Hi Matt, thanks for reading and your input. We’re always sure that kids are protected in any classroom activities that we introduce and have observed that the balloon popping in this activity really helps to grab their attention.